1. 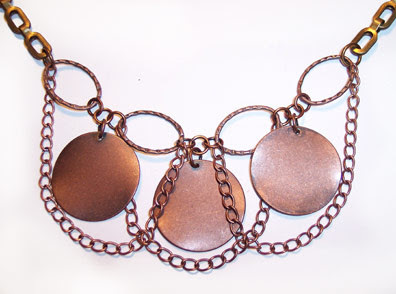 Attach oval links together with copper jump rings as shown. 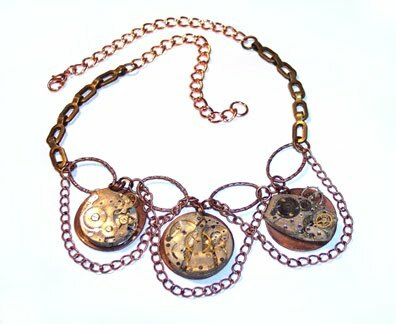 Add dangling 4 ” pieces of small copper chain and copper discs with jump rings. 2. Attach oval links to the brass chain pieces with large brass jump rings. 3. Attach copper bracelet chain to each end of the brass chain with large brass jump rings , with the clasp on the outside to use as a necklace clasp. 4. Stir up some epoxy resin and use to adhere watch parts to copper discs.